India will domestically produce six nuclear-powered submarines and seven stealth frigates. The Indian government has cleared plans for the indigenous development and construction of important naval assets, including six nuclear-powered submarines and seven stealth frigates. According to sources cited by both Indian and international media, the decision was made recently by the Indian Cabinet’s Committee on Security (CCS). The total cost of these defense initiatives stands at an estimated $8 billion. Inducting these submarines and frigates into the Indian Navy will broaden New Delhi’s strategic options in the Indian Ocean. Additionally, the projects will help realize Indian Prime Minister Narendra Modi’s plans to indigenize defense production while modernization India’s military capabilities. As part of Modi’s “Make in India” campaign, the government is eager to build up a robust domestic military-industrial base while simultaneously lowering India’s reliance on defense imports. India is currently the world’s largest arms importer, relying on Russian and U.S. arms for a large portion of its needs. In recent years, India has developed some competency in indigenous production. 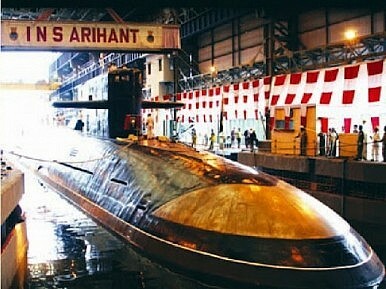 For example, the INS Arihant, India’s first indigenously designed nuclear submarine, is currently undergoing sea trials. That the government’s announcement emphasizes maritime assets should come as no surprise. Despite facing land-based conventional threats from both Pakistan and China, India has focused on modernizing its navy in a bid for greater access and control over the Indian Ocean. New Delhi’s interest in naval modernization has been intensified by perceptions of an increasingly assertive China slowly making its way into the Indian Ocean region. “Our security challenges are well known. Our international responsibilities are evident,” Modi remarked on Wednesday at a defense trade show. He noted that India needs to increase its “defense preparedness.” After coming to power last May, Modi’s government increased limits on foreign direct investment in India’s defense sector, allowing for 49 percent stakes for non-Indian interests in defense projects. Additionally, India’s defense expenditures are expected to accelerate over the next few years to meet modern challenges. The plan to add six nuclear submarines is a modification to a decision made last fall by India’s Defense Acquisition Council (DAC) that approved the construction of six conventional diesel-electric submarines. “The government has tweaked the project under which the CCS has taken a decision that the next six submarines would be nuclear-powered, unlike the conventional ones that were envisaged,” a government source told the press. Both initiatives are part of a broader 30-year submarine force building and modernization plan approved by the Indian government in 1999. Other initiatives, including India’s development of six Scorpene-class diesel-electric submarines and refurbishment and upgrading of the Sishumar- and Sindhughosh-class vessels, are also part of this plan. Currently, India’s submarine force is largely outdated and limited in its capabilities — India currently operates just 13 diesel-electric submarines.